This is the secure order form for custom made to measure Dehner Motor Patrol boots. 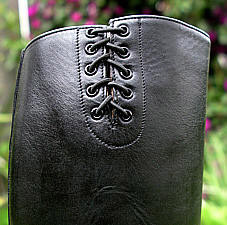 Each type of boot has its own order form. If you'd prefer to order the stock / "ready to wear" Dehner Motor Patrol boots, please click here. If you would like to order equestrian boots, please email us for more detailed instructions and an order form with more a more comprehensive set of options. Scroll down to see this whole order form... it's all on this page... no need to jump all over to see it. And you don't have place an order. You're welcome to just read the additional information that's on this page. Price of these custom made to measure boots varies from $799 to $1,179 depending on the choice of leather. These prices are shown on the order form below next to each leather selection. Some optional features cost extra. In those cases, the price is noted next to the selection box for the option. The motor patrol boots are made with a double midsole, the equestrian boots with a single midsole. The extra cost of the double midsole has been included in our pricing. is typically about 10-12 weeks. Fill out this secure online order form below and hit "Send" to transmit your order information to us. We'll check the information and email you an initial order confirmation. Please do not pay until you receive our order confirmation email with all orders details including boot and shipping costs and you are satisfied with the details. Fill in the Custom Measure Form, which you can download from the link below, with your foot and leg measurements and mail or email it to us. There are two forms, a simpler and shorter form for Motor Patrol boots and a more comprehensive form for equestrian boots. You can use a pencil so corrections are easier. Trace the outline of your feet on the back of the measure form or on a separate piece of paper with a pencil. Please mark the dimension on each axis in inches or centimeters so we can be sure the dimensions are still correct after being emailed to us as a PDF. Of course, if you mail us the original this is not necessary. Here is an example of a foot tracing with added dimension information on each axis. Do not pay now. We'll send a final confirmation once we have your measure which will include the price of the boots and shipping. If you've selected PayPal as your payment options we'll email a PayPal invoice when we send the order confirmation. If you need to change an order detail which changes the price, simply ignore that PayPal invoice... we'll send an updated one. The Motor Patrol boot / police measure form has instructions for taking your measurements. It's easiest and best if you have someone else take your measurement. We provide additional information below and also provide a link to the Dehner Company's web site which has step-by-step advice. The measure form (link is below) is miraculously sized to print correctly on Letter sized paper in the USA and on the A4 sized paper used by the rest of the world. Each foot's outline is traced along a diagonal on the back of the measure form (or on a separate sheet of paper) so the two outlines cross each other in an "X". If your foot size is larger than U.S. men's size 11, the outlines may not fit on the back of the printed measure form. In that case, use a separate larger sheet of paper or tape two sheets together. This Equestrian measure form is used by Dehner's bootmakers for every type of police, military, polo and equestrian boots. Because of this, it has an abundance of extraneous detail which isn't needed for these motor patrol boots. So, you only need to trace the outline of your feet, fill in the measurements and put your name on the form. We'll use the information you provide in this secure online order form below to fill in the rest of the measure form for you. The actual measure form should be mailed to us to ensure that we get an accurate tracing of your feet. 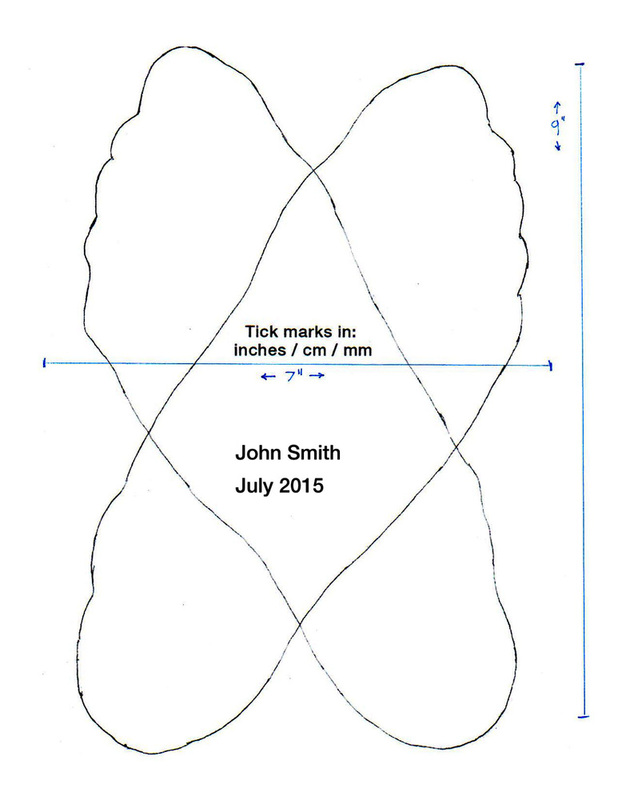 If you scan it and email it, it's possible that the dimensions of the tracing might be distorted so that the tracing wouldn't be accurate when used by the bootmaker to build your boots. However, depending on your scanner and software you're likely to get an accurate scan to email if you make a PDF. If you do this, please place a set of tick marks parallel to the side and bottom of the tracing sheet and indicate the exact distance between each pair of marks. This allows us to verify that the tracings were not distorted in length or width. Click here here to see an example. The measure form has detailed instructions. Dehner also has a page devoted to measuring tips at their web site. Here are the most important points to consider in taking your measurements. Take the measurements over the same type of socks and breeches or pants you will wear under your boots. If you wear heavier socks and breeches in the wintertime then take the measurements over your winter gear. Do the measurements later in the day. Feet can expand a bit as the day goes on. Don't pull the measuring tape too tight... it should be tight enough to stay in position but you should be able to easily slip a finger under the tape. All leg measurements are taken while seated. Foot measurements are made with your legs crossed and foot off the floor. The foot outline tracing is done while you're standing and wearing socks. Pencil must be kept vertical at all times. You need to lean slightly forward so the pencil top won't hit the back of your leg as it goes around your heel. Item 7, boot height, is the height the new boots should be made, not the height you want the boot to come up to on your legs .after they are broken in. On motor patrol boots, measure the desired height from the floor up to the correct point on your leg then add ¾" or 2 cm. 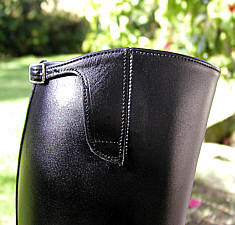 As you wear the boots, the ankle will crease causing the boot shafts to drop down about ¾" or 2 cm to the desired height. Please put a note saying whether or not you have already added the ¾" or 2 cm to the desired height or we will have to ask you. The correct height is "as high as possible". The boots shown to the right are correct / as high as possible. They couldn't be any higher or they would interfere with the bending of the knees, but note that they seem lower when the leg is straight. This point is shown on the measuring form diagram as "top". This is the point where your knee bends. Any higher and the boots would dig in at the back of your knees. Any lower and the boots would be too short. See the pictures on the right. 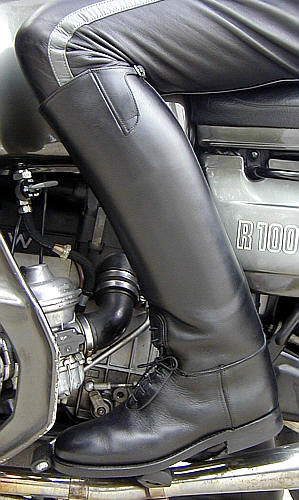 This is a boot which is as high as possible, but it doesn't look too high when the leg is straight, in a standing position, instead of being bent in riding position. This is why the measure form instructs you to take this measurement while seated with your knees bent to the 90° angle. This discussion about height assumes you will be wearing snug / tighht fitting breeches. You should wear snug breeches or pants for correct appearance with these high quality riding boots. If your breeches or pants are loose around the knees they will bunch up and be baggy just above the boot top. If you're concerned that this might happen, then have the boots made a bit lower or get better fitting breeches / jeans. Remember that even breeches with large flared or "balloon" tops are always very slim through knees to correctly fit into your boots. And even thick Langlitz leather breeches are made with a thinner, tighter, more supple leather at the knee. If you wear jeans with these boots, slim fit / stretch jeans work best. This secure online order form takes you through the various options and choices you have in specifying how you want your motor patrol boots made. It also collects your shipping address and information on how you prefer to pay for the boots. Once you've filled it in, send it to us by hitting the "Send" button. We process your order manually, so we can make sure everything is correct. We'll then send you a preliminary confirmation email and check with you if we have any question about the order. When we receive the measure form you mail us, we'll verify all the information on the order. Once any questions have been taken care of and the bootmaker is ready to start building your boots, we'll process the charge for your order. Don't worry if you forget something. You can send follow-up email to us anytime at . For our part, we will email you with questions, if we have any, and keep you informed about your order. The price of these custom made to measure boots is largely determined by the type of leather used to make the boots. Most options have no cost associated with them, those that do show the price of that option next to the option choice. We'll send the order total and shipping cost with the initial order confirmation. The total cost of a pair of custom boots is the price shown next to the leather choice, plus the cost of any options plus shipping. Except for orders shipped to California, there is no sales tax. Orders shipped outside of the U.S. may be subject to various custom duties and taxes when the boots arrive in your country. Please direct complaints about these fees to your politicians or elect better ones if given the choice. If you live in the European Union, be aware that the customs duties are included in the computation for the Value Added Tax (VAT). Congratulations! Your taxes are taxed because of their added value (!?). On the other hand, you do have universal health care and people in the U.S. do not. Click here to see leather samples. The leather type determines the base price for these boots. Base price is shown next to each leather choice. This is the same configuration as the stock boots. If you require a shaft height over 21" high, there is a $110 charge. If your calf measurement is over 21" there is a $120 charge. No Yes Has Dehner made boots for you before? and have a preferred size, please enter it here. size and width -- "8 E W"
The standard configuration on Motor Patrol boots is a double midsole and a Nitrene rubber composition sole with a rubber heel. The "double" midsole is achieved by adding a &frac18;" / 3 mm rubber midsole between the leather sole and the rubber outsole. 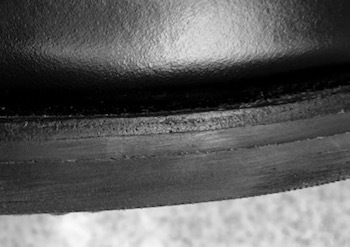 The entire sole is about ½" (13 mm) thick. It is oil resistant and has a mild grip pattern. This is considered a double sole by Dehner because it is has an extra midsole component which makes it about &frac18;" thicker than the equestrian boot soles. We don't recommend the leather sole and heel for motorcycle riding because they can be quite slippery. But you can also specify a rubber heel with the leather sole for better traction. The optional Vibram lug sole is a popular option in hilly areas. For instance, many CHP and San Francisco motor patrol officers have their boots made with the Vibram lug soles for better traction on the hills of the city.